Botox Training MD has slashed their Botox training course membership for a limited time. We're happy to announce a new partner for Medical Spa MD, the American Society of Aesthetic Medical Professionals. The American Society of Aesthetic Medical Professionals was founded by plastic surgeon Dr. Marc Scheiner and runs a number of Botox and filler injection training seminars, generally in the North East. Their training courses are attended by physicians, dentists, nurses, physician assistants, and nurse practitioners who are interested in adding Botox and fillers to their practice. You can find their main site here and view their upcoming course dates and registration page. Their training training courses take place over 2 days. The first day of training is dedicated to Botulinum Toxin injections and the second day to dermal fillers. You may choose to attend one or both days of the course. The courses assume you have no experience in aesthetic medicine and are designed to educate you in the evaluation and treatment of facial ageing using Botulinum Toxin and dermal fillers. You will be trained to inject Botulinum Toxin and dermal fillers with an experienced plastic surgeon. Participants in the certification courses will inject actual undiluted Botulinum Toxin and Dermal Fillers. You will find that many training programs use diluted Botulinum Toxin or normal saline. We will maximize your learning experience by replicating an actual client encounter using the correct product and live models. This is a hands-on course and you will be required to inject the products using a model that you bring. After participating in many different training seminars it has become apparent that the most effective way to teach cosmetic injections is to have the participants provide their own models. Previous experience teaching injection methods using volunteer models has been unsatisfactory as often the models only want 1 or 2 areas treated. This leaves the participant without hands-on training in all areas. Furthermore, it is beneficial to the injector to actually see the results of his/her treatments in the weeks following the treatments. With a volunteer model, the participant will likely never see them again. Finding a model to inject Botulinum Toxin and dermal fillers requires you to simply bring a spouse, friend, brother, sister, mother, employee, or any other willing participant. There's always been a tremendous interest in training courses on Medspa MD. We hope that the inclusion of ASAMP and Botox Training MD will bring a valued asset to the commuity. Before you leave the consultation room ask your patient this question: What's a 'home run' for you? Consultations are where the money gets made in a medical spa but understanding and managing expectations with your cosmetic patients will keep you out of trouble, and your patients coming back. One of the very best ways to understand where your patient's head and expectations are is to ask, 'What's going to be a home run for you?'. You're probably already trying to set expectations and get to know what your patient's after - you're in a consultation room after all - but I'm talking about some thing other than asking about 'What are you looking for?' or 'What are you trying to change?' which are the most common types of questions. There's a lot you can do to increase your revenue in the consultation room. Don't miss the opportunity to set up your patient for the big win. When you ask, 'What would knock the ball out of the park for you? ', you're tapping in to some triggers that give you a much better feel for where the patient is, and creates a complete buy-in if you're able to align those 'big win' thoughts with manageable expectations. This is a part of the consultation that a lot of physicians miss by just asking general expectation questions like 'What are we trying to accomplish?' or 'What are you looking for?'. These kinds of milquetoast questions don't have any teeth. Look, no one is coming in to your clinic with 'age management' as their goal. That's a totally goofy doc-talk deal. Patients are looking to drop 20 years. Once you've gone through the consultation you'll have a pretty good feel for if you're going to be in the running for making this patient happy or not. If you're not going to make the person thrilled, give careful consideration to treating the patient at all. But if you're pretty comfortable with the treatment and feel that you can deliver, ask the patient what they would consider to be a grand slam home run and then discuss it. Don't try to talk them down too far. They'll be pretty reasonable (or you'll see that you can't make them happy) if you give them some rope here. Everyone likes to have happy patients. They don't sue you and if you're lucky, they'll tell a friend or two. But how often do you think of 'patient satisfaction' as a byproduct rather than the actual aim. Setting up your consultation with this kind of 'big win' potential gives the patient a target to aim for and a peg to hang their hat on if you come close. If you deliver, the patient feels that it wasn't just an average treatment and that you really are the cosmetic guru you're website says you are, and if you fall short you're still in the ball park and all is not lost. Don't create more patients. Create more zealots. Meeting expectations creates another satisfied customer. Boring, and not the way to build your business. But if you can use the consultation to define what a 'big win' is, manage expectations around that end point and then deliver on those, you're creating a zealot, and zealots build your business for you. Yes, you already have a few zealots. Everyone else does too. What you're looking to do here is bump up the percentage of zealots that you produce, because they'll work tirelessly to drive new patient traffic. This tiny change in the way you think about your consultations can deliver disproportionate results. This advanced Botox tutorial covers a number of Botox treatments around the forehead and around the eyes including injecting the Frontalis, Obicularis Oculi, Corrugator, Procerus muscles. This advanced Botox tutorial covers a number of Botox treatments around the lower face including injecting the DAO, Mentalis and DLI. Our New Facebook Group: Physicians + Facebook Marketing - How to do it correctly! Join our Facebook group: Physicians + Facebook Marketing - How to do it correctly! Facebook now has more than 500 million accounts.... and if you're not using it to promote your services and build a community around your medical spa or clinic, you're missing the point. Rather than just discuss Facebook marketing here on this site, we've decide to actually show you how to do it by using Facebook. The new group that we just started, Physicians + Facebook Marketing is only a few days old. So far, we've got 30 people to join and we're going to grow this group while showing you exactly how we're doing it... on Facebook. We'll have a number of our staff who are responsible for our social network marketing on Facebook, LinkedIn and Twitter in this group to answer any questions you may have, or just learn from the case studies and articles. You'll also want to listen to some of our new podasts since we've been discussing social marketing on there. 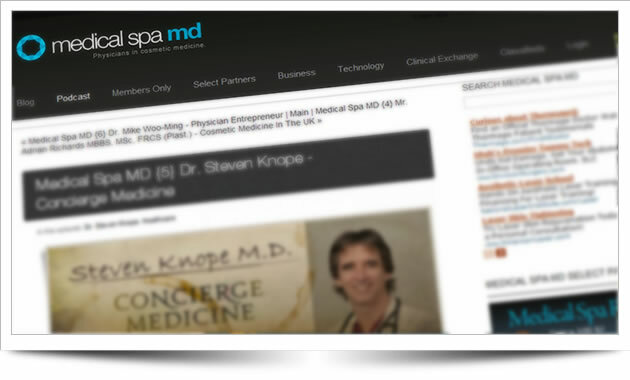 Need A Critique Of Your Medical Spa Website? OK, I'm ready to throw some rocks at a few of the medical spa and laser clinic web sites that I'm seeing. I'll review your site right here by making and posting a screencast of my thoughs and digging in to your site's structure, design, functionality and SEO attributes. You'll get some insight about best practices and things you could be doing to drive additional patient traffic an increase your site's visibility, and everyone else will get to watch.